Matte colors are no longer just for primer, they are becoming a new style that is taking the creativity of colors to new levels. 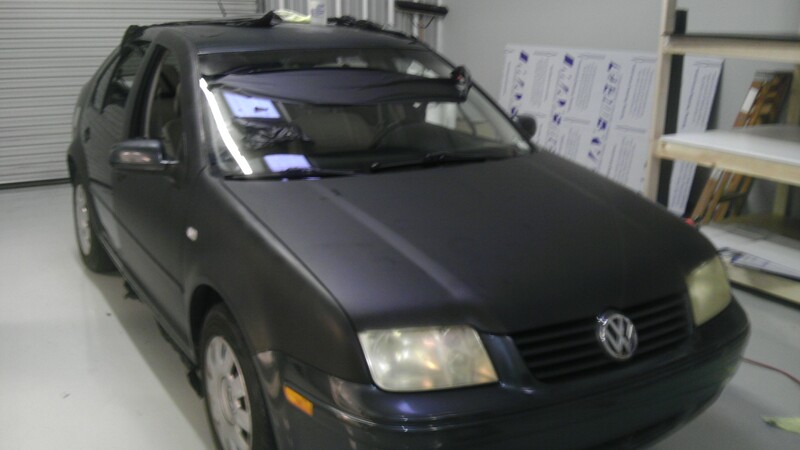 This green VW Jetta got wrapped in a matte black followed up by carbon fiber on the hood, roof, mirrors, and gas tank to give it more character. A color in which most people look at as a “primer” or unfinished paint job is now a new style that is starting to get some second looks while driving down the streets. Almost every car on the road has a gloss finish, and the ones that don’t are unfinished paint jobs or cars with replacement parts from junk yards. 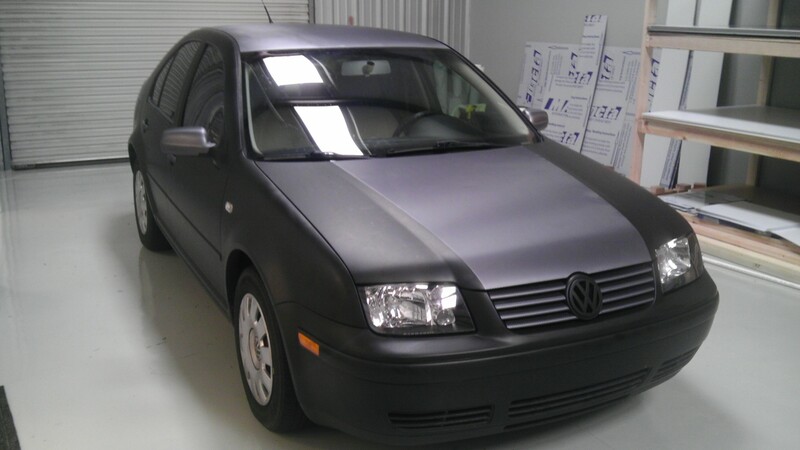 Obviously when half your car is gloss and half is matte it is not going to look good, but instead of going all gloss you can change the style and go all matte. Now you have a new style that gets people to look your way. 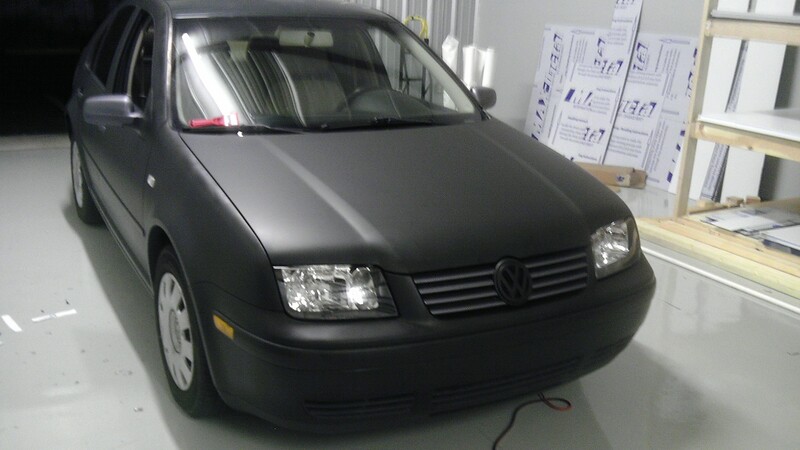 But don’t think going out and painting your car matte will solve your problems and there’s a few reasons for that. One being that a primer paint will not hold up for very long, after the weather beats on it, it will start to fade and even have spots where your gloss color sneaks out from underneath. Now you have a matte color with spots of gloss color shining on it. Another reason being why mess up the initial factory color of your car? Once you paint it your stuck with that color until you paint it again. 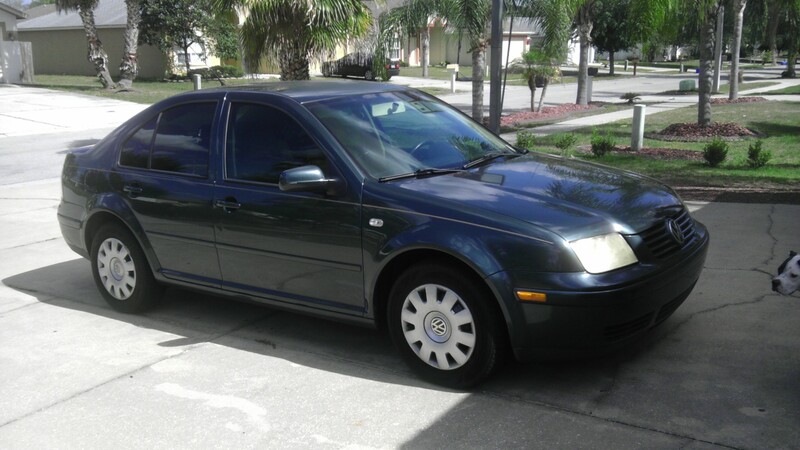 With a vinyl wrap you can put on this color, which will last 5-7 years, then when you decide to sell the vehicle or that you are sick of the color you can remove the wrap and you are back to your original factory color. No damage done to the paint, as a matter of fact the vinyl acts as a protector to your paint underneath. Carbon Fiber is a sleek and exciting pattern that has been around but is starting to have some new and more frequent looks on vehicles. In the past you would see pieces of a car such as the hood or roof in carbon fiber. Now with this new material it can be used as an accent for your paint job, graphic decal or strips. There are also many cars driving around as completely carbon fiber. Carbon Fiber is a very distinct look, usually being lighter in weight. 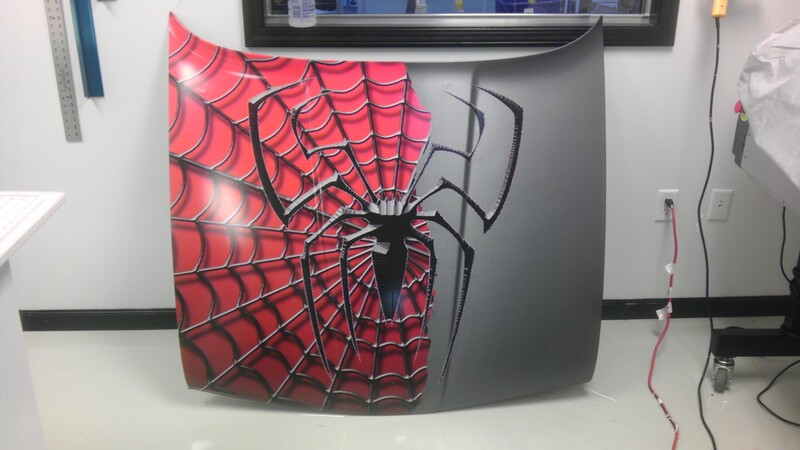 When using vinyl carbon fiber material is does not decrease the weight of your vehicle but, at Laser Sharp Sign Design we can give you the best product of carbon fiber.Using 3M material, the best in the business, we can provide with carbon fiber colors, not only black, also grey, white and many other colors. With this BMW we took a spider man print and bonded it together with a grey carbon fiber. With a HP printer and Graphtec cutter we were able to print the spider and web and follow it up by putting it in the cutter. By putting it is the cutter we were able to easily cut out half of the spider and then place it over the grey carbon fiber to bond the two materials together. We now have the effect of the carbon fiber being teared of and the spider image coming out from underneath. Get out of the original color ideas and come up with something like this to give your graphics custom looks such as this. Making you the center of attention.